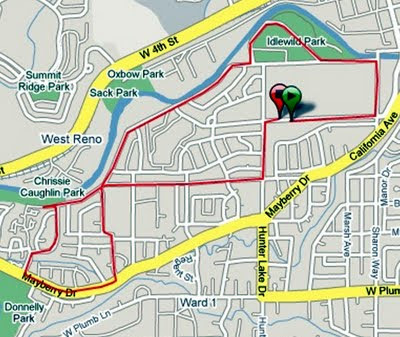 The Journal Jog is one of those local races that you just kinda have to do. I'm always amazed at the amount of people (and pretty fast people) that show up - It never seems like Reno has a very big running community until they ALL come together at one race. 12-1300 of them, in fact. There's been a little confusion in the past few years with this race - it used to be a 5 miler, then last year the course changed a little and it became an 8K. A new set of organizers did a good job this year (Castle Rock Multisports, the same people who do the Rock 'n' River runs in the spring) but they were overwhelmed by late packet pickups and had to start the race half an hour late. That meant standing around in the crowd, sun and heat and starting to feel dehydrated - not the best way to begin. I just ran my race, tried not to push too hard or go too easy. First mile was about 7:00, but then I dropped back into the 7:20s. Had a pretty down moment in the middle of mile 4 when I had to talk myself out of walking, but then turned a corner and the finish was a couple blocks away. So I put my head down and powered in. good job eh! the course has been 8k since I can remember, but was run in reverse and was changed to avoid a particular sharp downhill and left hand turn...especially for the strollers. Maybe next year for me.